Year 1973 marks the birth of World Rally Championship although it for the time being was only for manufacturers. For three previous years the concept of rally championship had been tried under title of International Makes' Championship but now time was ripe for proper World title. Since season was first year of the World Rally Championship, lots of first-ever -records were established. In practice however, 1973 was more of the same than anything really new as rallying had been around in organised fashion for long time and only now gained World status. There were many manufacturers involved with the Championship but it was Renault-Alpine that undertook the most serious attempt at the title. Running old and proven Alpine A110 1800 for squad of drivers, team won the title with convincing performance. Championship brought organisation and discipline to previously rather confusing and chaotic field of international rallying. Not that 1973 was free from controversy itself, quite the opposite. In Monte Carlo, the first WRC event ever, disaster struck on Burzet stage. Stage had been blocked by a snow storm before the event even started but organisers decided that stage will run. Some fifty crews managed to get through before a competitor span into a snowbank and blocked the stage for good. Competitors arriving later created a massive blockade and by the time convoy got moving again, they were all excluded for exceeding maximum lateness. 144 crews, half of the starters! Affected crews were privateers who felt that their cause was not taken seriously and they decided to raise their collective voice by blocking the route and forcing all the other competitors over maximum lateness, too. Plan leaked out and organisers alerted police to dispand the impromptu protest. Some tense moments followed between gendarmerie and both camps of angry competitors but in the end rally continued. Further controversy was in the air in next round, held at Sweden. 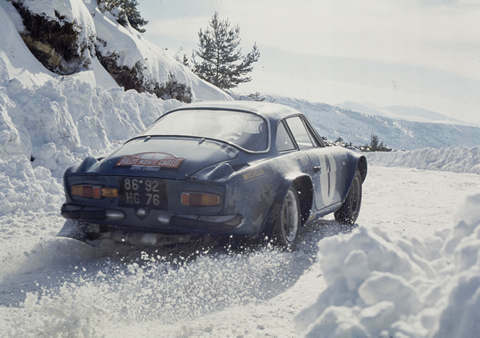 Organisers had banned use of studs which made recce an adventure for crews trying to practice in icy conditions. Conditions for the rally itself improved as snow fell and made roads less slippery. Saga continued in Poland where only three (!) competitors finished the route. This was not the end of it as two events later in Austrian Alpine Rally winner Achim Warmbold was first excluded and later re-classified. Renault-Alpine A110 driven by Bernard Darniche who finished 10th in Monte Carlo despite being seeded with start number 1.